Alexander Calder redefined sculpture by introducing into it the element of movement. He created sculptures and design objects that participated in the larger tendencies of European and American avant-garde, uniquely combining abstract art, modernist principles, machine and cosmic imagery in his works. His major contribution to the modernist redefinition of artistic media is the invention of two new categories of sculpture, called mobiles and stabiles. The mobiles are constructions made of suspended objects that hang down from the ceiling and continuously move with the flow of air. 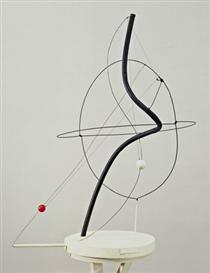 These evolving sculptures served to Calder’s exploration of sculpture and its site of display, which led him to introduce space and movement as fundamental elements in the encounter of the audience with the work of art. In their movable nature, Calder's mobiles can be seen as an example of Kinetic art. The stabiles are large-scale fixed versions of the mobiles, which the artist created in his late years. These monumental abstract sculptures were installed in urban spaces around the world and contributed to revamping the conversation around public sculpture in the last decades of the 20th century. Calder was born in Pennsylvania, Philadelphia in 1898 to artistic parents. His father was a successful sculptor, and his mother worked as a portrait painter all her life. Calder's early fascination with sculpture began at the age of nine in his father's studio, where he started experimenting with mechanical devices and materials such as wire, sheet metal and wood. He created there his first constructions based on animal-designs. The fascination with construction and industrial materials would later bring Calder to graduate in mechanical engineering. The studies in physics and applied kinetics will crucially effect the artist’s early experiments with mechanized constructions. After trying many disparate jobs, Calder decided to follow his artistic leanings, and in 1923 enrolled at the Art Students League to study drawing and painting. At that time, the Art Students League's faculty was composed by The Eight - a group of realist artists whose determination to bring art into closer touch with everyday life greatly influenced the course of American art. Calder's first large canvases and drawings of that period were directly inspired by his instructors' broad realist style and their ideas of freedom of artistic expression. In 1926, Calder made the first of many trips to Paris with the desire to gain first-hand exposure of European Modernism. He became fascinated with the European incorporation of non-academic artistic media in sculptural practices as well as with the new stylistic directions in American art, which were building on the influence of European Cubism, Futurism, and Constructivism. 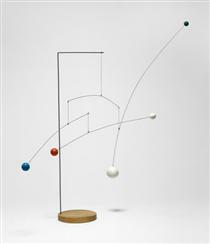 Elements of Constructivism and its notion of achieving painterly effects through sculptural materials are particularly evident in Calder's works from 1926 to 1930. These include sculptures made of a single metal wire, such as Josephine Baker (1927), Rearing Stallion (1928), and Portrait of a Man (1929). 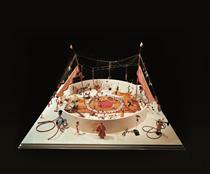 These experiments with wire culminated in the creation of Calder's Circus (1926-1931), a miniaturized rendering of a circus featuring a complex arrangement of figurines of performers, animals and props. 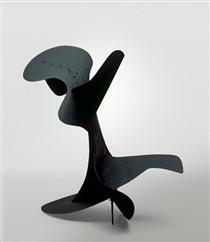 Made of wire, wood, metal, cloth, leather, these sculptures were specifically designed to be manipulated by Calder. The artist gave performances of his kinetic circus in New York and Paris throughout the 1930s, receiving critical acclaim for his elaborate creation of a moving sculptural ensemble. 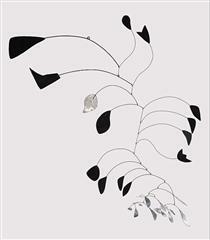 By 1928, Calder had started to gain popularity and was given his first solo show in New York at Weyhe Gallery. Throughout the 1930s, he continued to exhibit in New York, Paris and Berlin, and developed friendships with European and American avant-garde artists, such as Joan Mirò, Marcel Duchamp, Fernand Lèger, and Piet Mondrian; as Calder recalls in his autobiography, a visit to Mondrian's studio was a "shock" that led him to embrace complete abstraction. The move towards abstraction translated into the creation of a series of kinetic sculptures, dubbed mobiles by Duchamp, including Crank-driven Mobile (1931-32), Dancing Torpedo Shape (1932), and A Universe (1934). Calder incorporated mechanisms and motors in these abstract constructions to make the separate elements move at different speeds, using the materials' density and weight as guiding principles in planning the sculpture's movement in space. He later gave up motorized constructions and dedicated himself to designing self-moving sculptures hanging down from a ceiling which could be activated by air currents. He also created stationary abstract works that Jean Arp dubbed stabiles. The first of Calder’s outdoor works were made during this era as well. The 1930s see Calder moving back to the United States and working on the construction of sets for ballets by Martha Graham and Erik Satie. In 1931, he was also invited to join the group Abstraction-Création, which included artists Jean Arp, Piet Mondrian, and Jean Hélion. Disks, spheres, wedges, and triangles in a rigorous palette of primary colors, black, and white, became the fundamental elements of Calder's mobiles from 1935 and 1936. Starting from 1936, the artist started to work on larger scale sculptures with the desire to generate even more dramatic casual spatial relationships. Lobster Trap and Fish Tail (1937), a mobile commissioned by the Museum of Modern Art in New York for the museum's stairwell, points towards this new monumental direction, as well as to Calder's interest in organic forms. During the 1940s and 1950s, Calder became internationally known - a unique position for an American sculptor at the time, - and was honoured with many prizes, commissions, and exhibitions. In 1945, Marcel Duchamp arranged a crucial exhibition of small-scale works made by Calder with scrap metal pieces at Galerie Louis Carré in Paris; Jean Paul Sartre wrote a seminal essay on the artist’s mobiles for the accompanying catalogue. In his late years, Calder dedicated himself to large-scale projects, stabiles, and various public commissions, including the .125 mobile (1957) for the John F. Kennedy Airport in New York, Teodelapio (1962) for the city of Spoleto, Italy, and Flamingo (1973), a monumental red-painted steel stabile for the Federal Center Plaza in Chicago. 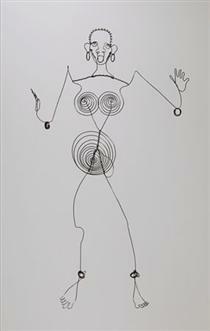 In 1966, Calder published An Autobiography with Pictures, a witty illustrated account of the artist’s personal life and prolific artistic career. Calder died in 1976 at the age of seventy-eight, a few weeks after visiting a major retrospective of his work at the Whitney Museum of American Art in New York. 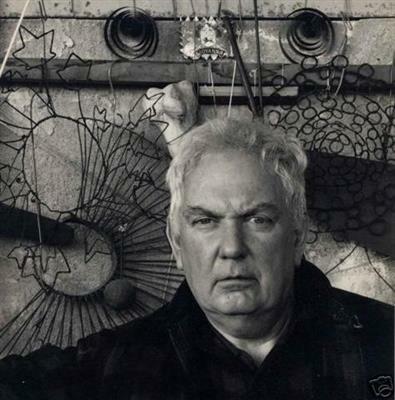 Alexander Calder (/ˈkɔːldər/; July 22, 1898 – November 11, 1976) is widely considered to be one of the most important American sculptors of the 20th century. He is best known for his colorful, whimsical abstract public sculptures and his innovative mobiles, kinetic sculptures powered by motors or air currents, which embraced chance in their aesthetic. Born into a family of accomplished artists, Calder's work first gained attention in Paris in the 1930s and was soon championed by the Museum of Modern Art in New York, resulting in a retrospective exhibition in 1943. Major retrospectives were also held at the Solomon R. Guggenheim Museum (1964) and the Museum of Contemporary Art, Chicago (1974). Calder’s work is in many permanent collections, most notably in the Whitney Museum of American Art, but also the Guggenheim Museum; the Museum of Modern Art; the National Gallery of Art, Washington, D.C.; and the Centre Georges Pompidou. He produced many large public works, including .125 (at JFK Airport, 1957), Spirale (UNESCO in Paris, 1958), Flamingo and Universe (both in Chicago, 1974), and Mountains and Clouds (Hart Senate Office Building, Washington, D.C., 1976). Although primarily known for his sculpture, Calder was a prodigious artist with a restless creative spirit, whose diverse practice included painting and printmaking, miniatures (such as his famous Cirque Calder), children’s book illustrations, theater set design, jewelry design, tapestries and rugs, and political posters. Calder was honored by the US Postal Service with a set of five 32-cent stamps in 1998, and received the Presidential Medal of Freedom, posthumously in 1977, after refusing to receive it from Gerald Ford one year earlier in protest of the Vietnam War. Calder's grandfather, sculptor Alexander Milne Calder, was born in Scotland, had immigrated to Philadelphia in 1868, and is best known for the colossal statue of William Penn on top of Philadelphia City Hall's tower. His father, Alexander Stirling Calder, was a well-known sculptor who created many public installations, a majority of them in nearby Philadelphia. Calder's mother was a professional portrait artist, who had studied at the Académie Julian and the Sorbonne in Paris from around 1888 until 1893. She moved to Philadelphia, where she met Stirling Calder while studying at the Pennsylvania Academy of the Fine Arts. Calder's parents married on February 22, 1895; his sister, Mrs. Margaret Calder Hayes, was instrumental in the development of the UC Berkeley Art Museum.